According to the Centers for Disease Control, 800 to 900 children drown annually in the United States. The drowning rate is highest amongst kids who are one to four years old. With this, if you have a swimming pool at home, it is important to make the safety of the kids your priority, which will be possible by keeping in mind the things that will be mentioned below. One of the easiest solutions is to install a physical barrier that will keep the children out of the pool when they are unsupervised by adults. You need to have a four-sided fence with a minimum height of at least four feet, which will take quite a while for the kids to outgrow. The fence should be made of strong materials, making sure that they won’t be easily knocked off. There should be latches that the children cannot reach so that they cannot accidentally open the gate. 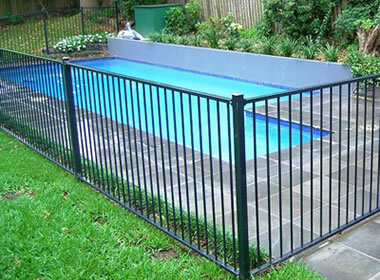 Similar to a fence, a swimming pool alarm will also be an effective way to protect the kids from any pool accidents. The alarms can exist in different forms. For instance, they can be attached in the doors to immediately warn parents if kids are able to get out. Some alarms are floating and submerged in the pool, which will automatically make a sound when kids get in the pool. If the pool is not used, it would be best to get rid of the toys on the water. If there is a float in the pool, this can tempt the kids to run to the water and play with the toy. On the other hand, when the toys are hidden from sight, there is a lesser likelihood that they will be tempted to get to the pool. If budget permits, an inground pool is recommended as it is sturdy and safe. An above ground pool can prove to be a cheaper alternative, but the problem with the latter is that it can compromise the safety of the little ones. There are above ground pools with soft sides that can make the children prone to accident. If you are using an above ground pool, it is important that you also use a top-rated swimming pool ladder that will make it easy for kids to get in and out. When the pool is not used, it will be best to keep the ladder away so that kids will not be tempted to get in the pool. There are also many inflatable and portable pools that can be unsafe for the little ones. At the end of the day, this is perhaps the most important thing that parents can do. You need to be vigilant. Keeping a watchful eye is your best defense against accidents. Do not let the kids play in the pool without an adult around, even if they know how to swim. There should always be a designated adult to take charge, specifically one who knows how to swim and provide first aid in case of drowning. A hurricane can result in serious and costly damages to your home, including your swimming pool. The good news is that the repercussions will be lessened if you demonstrate preparedness, which will be possible by keeping in mind the things that will be mentioned below. It is important to be proactive to eliminate potential hazards and to protect the structural integrity of your swimming pool. Most swimming pools will have their own electrical supply that can be turned off when a hurricane is brewing. This won’t affect the electricity in the other parts of the house. The swimming pool pump and motor are the ones that will be most prone to damages if you do not shut down the electricity. You should remove the motor and have it relocated to a place where you are sure it will be safer. You can also wrap it in plastic or tie it with a rope so that it will stay in place. When the hurricane is over, before turning back the power supply, take the time to perform a quick inspection to make sure that there are no damages that can result in potential hazards. It may be tempting for some people to drain the water out of the pool before the hurricane. However, this is one thing that you should never do, especially if you have an above ground pool. If the water is drained, the pool will not have the weight that is required in the bottom and sides for it to remain in its place during a strong wind or heavy rain. Even inground pools should not be drained. Chances are, they are equipped with an innovative feature that will prevent overflow. It would be best to lower the water level only at a maximum of two feet, but it should never be completely drained. You just have to make sure that the drains and the skimmers are working properly so that the water won’t end up overflowing. 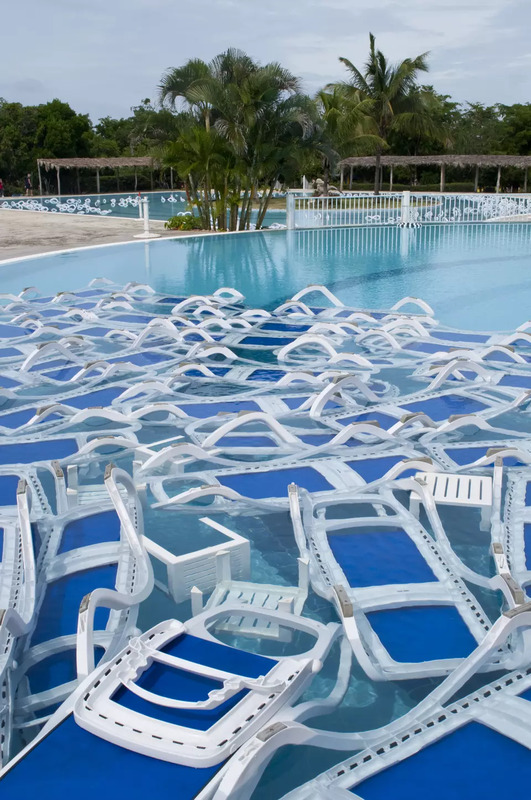 It will also be best to get rid of anything surrounding the pool that can be detached or blown because of the hurricane. If you have chairs and tables surrounding the swimming pool, take it inside. If there are swimming pool lights that are not permanently installed, you should remove them. The same thing is true in the case of slides and ladders that are not permanently fixed in your swimming pool. You will also have to deflate the floats and keep the toys indoors. Get rid of any loose items that might end up flying around because of the hurricane. It is also advisable to trim trees around the pool or house.